Dress with square or sweetheart front neckline has front buttoned bodice or back neckline zipper closing. Ties belts joined at side side seams form back bow. Two patch pockets on dress skirt. Optional rick rack trim. Size 2; Chest 21; Waist 20. Unprinted pattern pieces precut to size and perforated for identification. 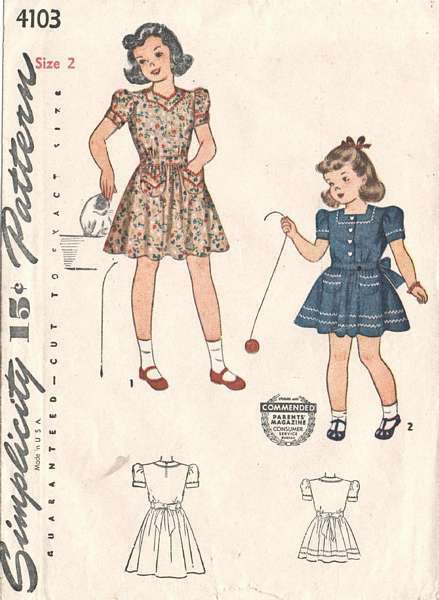 Note: Mother/Daughter fashion patterns were popular in the 40's. Simplicity released this same style dress in a "Mother" size in the 40's. For your reference, that pattern number was 4102. We do not have that pattern (4102) in inventory at this time but can place your request on our Customer Wish List if you contact us.